The President Hotel in Budapest eagerly awaits all those guests who like to travel in style! The comfortable rooms offer and elegant stay, with a wealth of facilities on offer. The outstanding restaurant delivers mouth-watering cuisine and a perfect night out for those staying at the hotel. The Budapest President also offers an exclusive wellness and fitness spa for relaxation, ne has three conference rooms available for use. The contemporary design of the hotel, including a heliport and a panorama terrace with breathtaking views of the city, has made the President Hotel in Budapest a new tourist hotspot which is most definitely worth a visit. 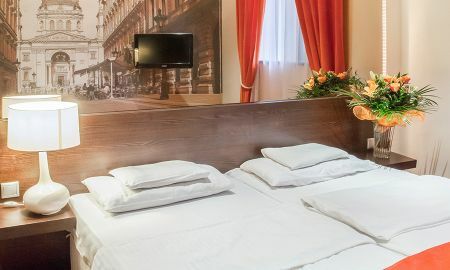 The luxurious 4-star President Hotel is situated right in the cane of the exciting city of Budapest. It is just a short walk away from the famous buildings of parliament, and within easy reach of the bustling shopping and business district. 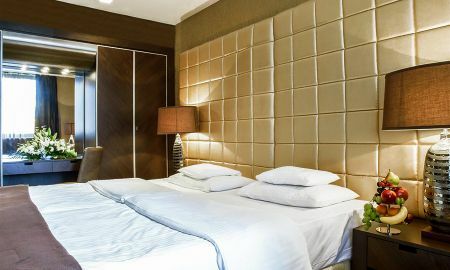 Well connected on the city's metro line, the Aranyakas Janos Street Station is just 200 metres away from this fantastic hotel.